Maria and Tom Tarapacki share the story about how, after the exterior of their home was re-sided and spruced up, the mail carrier was so startled by the transformation he had to double-check the address to make sure he had the right house. The exterior makeover is just one of the projects the Tarapackis have tackled during the past five years. 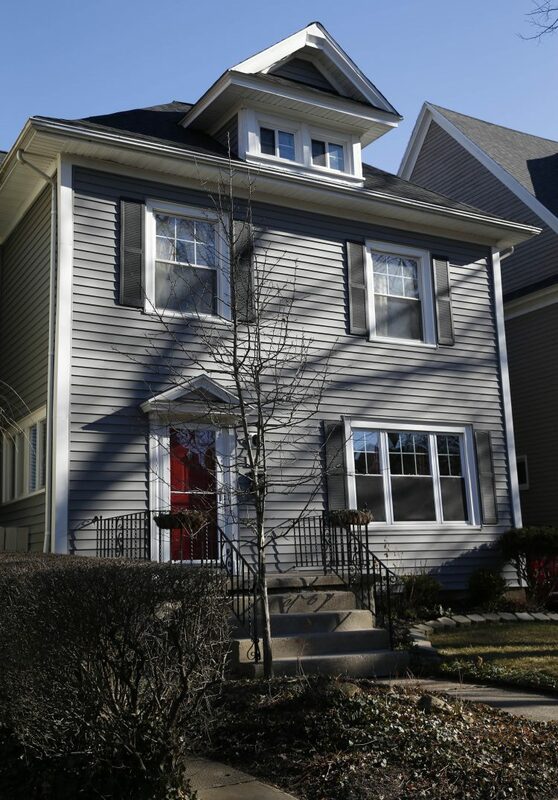 The couple, who married in 2014, live on the first floor of the two-family home built in 1896 in the Elmwood Village. The house, which Tom Tarapacki bought in the late 1980s as income property, has much going for it. Original staircase, doors and hardware. A kitchen large enough for an island with stools. Ample storage, including an attic and basement. A backyard with space for a patio and garden. The couple took on many projects themselves but hired professionals for electrical and carpentry work. 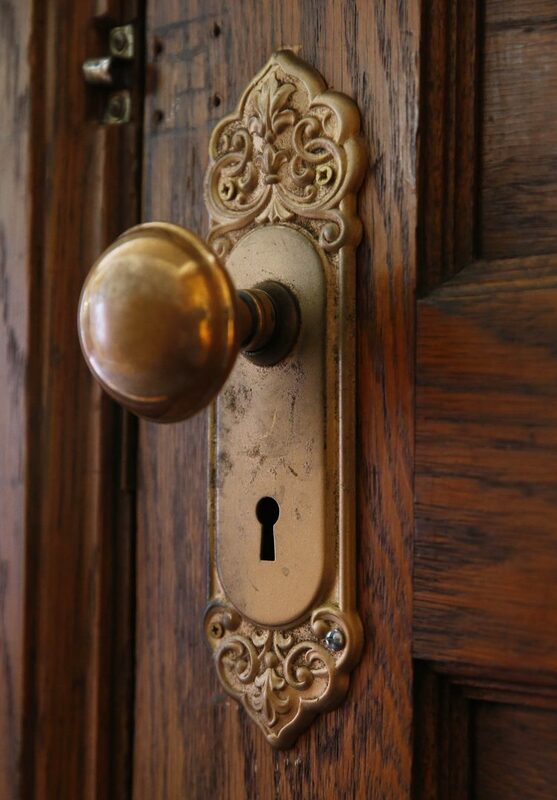 They also reused and repurposed as much as they could, from buying and refinishing used furniture to having an old bedroom door refitted for the kitchen entrance. Last February, the residence was featured as a Home of the Week – an ongoing Buffalo News online feature – after Maria submitted before-and-after photos of some of the work they had done on the place. Earlier this week, the News returned to photograph more of the home’s interior, furnishings and accessories and to interview the couple about the makeover. • The couple updated the kitchen with solid natural oak cabinets and an island that came from Maria’s sister’s kitchen, which was being remodeled with new cabinets. Two additional cabinets in a similar finish, new hardware, laminate countertops and fresh paint completed the space. • Maria spent about a year stripping, sanding and varnishing the handrail and spindles on the staircase. The stairs were professionally refinished by Jeff Morningstar and Aaron Horrigan of Horrigan/Morningstar hardwood floors. • The couple added a faux-tin ceiling in the foyer using “Allusions” glue-up panels. They bought them online from Chaska, Minn.-based Surfacing Solution, said Maria, a graphic designer who grew up in West Seneca and East Aurora. • New wainscoting and crown moldings were installed and, after the couple decided to go for it, the “sunburn red” brick surrounding the faux fireplace was painted a creamy white. They said they’re glad they did it. • Among the estate sale finds: An extendable dining table and chairs they bought for $100. The legs of the chairs had been chewed on by the former owner’s puppy. After some sanding and fresh stain, it’s hardly noticeable. • Windows were replaced a few at a time. In addition to the new charcoal gray exterior siding, which replaced the old mismatched green clapboards, the existing front door was painted red and dressed up with white trim. “People just kept coming by and saying ‘Wow’ – and painting the door red really made it pop,” said Tom Tarapacki, who works for the City of Buffalo and grew up in the Broadway-Fillmore area on Buffalo’s East Side. The Tarapackis say there are more projects to come. They plan to pull up the carpets in the foyer and living room, which for now are topped with large area rugs. They want to replace the wood laminate flooring in the kitchen, perhaps with tile, and will soon complete the renovation of the bath. They also are deciding what to do with the remaining dark paneling on one wall of the living room. In the meantime, come May, new striped awnings will arrive for above the two second-floor windows – inspired by the ones seen in the 1901 photo of the home’s exterior that they found at the Buffalo History Museum. Layout: The first floor has a large foyer with staircase. One door opens to the living room on the right; another to the kitchen straight ahead. 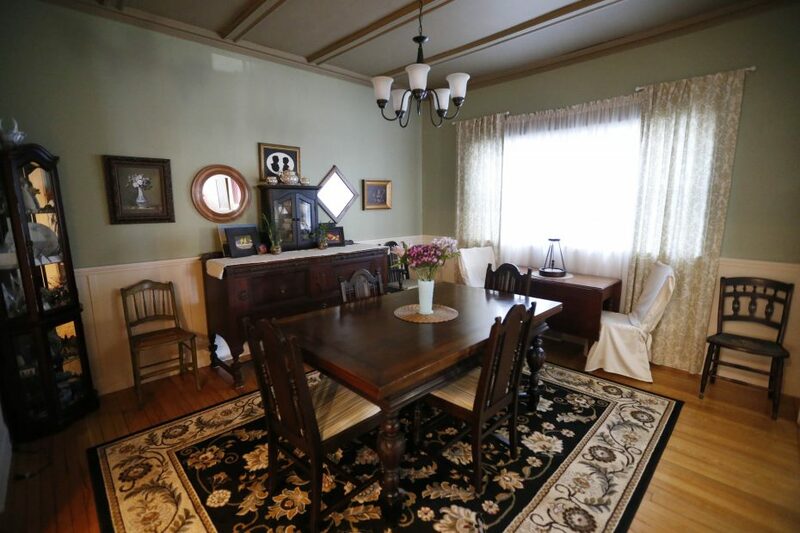 The dining room is off the kitchen and connects to the living room. The back part of the house, which was added about 1960 when the house was converted into a double, has a full bath and three bedrooms. The second floor, a rental apartment, originally had four bedrooms. There’s also an attic that once served as servants’ quarters and a basement. Furniture: Many estate sale finds and hand-me-downs refinished by Maria Tarapacki. Highlights include a bench in the foyer that was originally a church pew and an old piano that Maria and her son refinished and re-purposed into a desk. Floors: Hardwood, laminate wood flooring, layered carpets, ceramic tile in bath. Paint colors: Dutch Boy Herbal Dash (walls), Imperfect Pearl (trim) and Hen House (ceiling) in the dining room. Dutch Boy African Sunset and Sun Tunnel in the kitchen. Dutch Boy Prairie Purple in the bath. Custom cream by Behr in the living room. Window treatments: Ivory lace cafe curtains in the foyer with burgundy-and-gold brocade valances sewn by Maria. Grommet drapery panels in the living room. Sheers and draperies in the dining room. Draperies in the master bedroom. Accessories: Oil still life and landscape paintings and charcoal portraits by Maria. Buffalo-themed decor, artwork and historic photographs, including framed prints depicting the 1901 Pan-American Exposition and a photo of the original home, also from 1901. Family photos. Houseplants. Baskets for storage. Globes, bobblehead dolls and other collectibles. A hat display in the foyer. 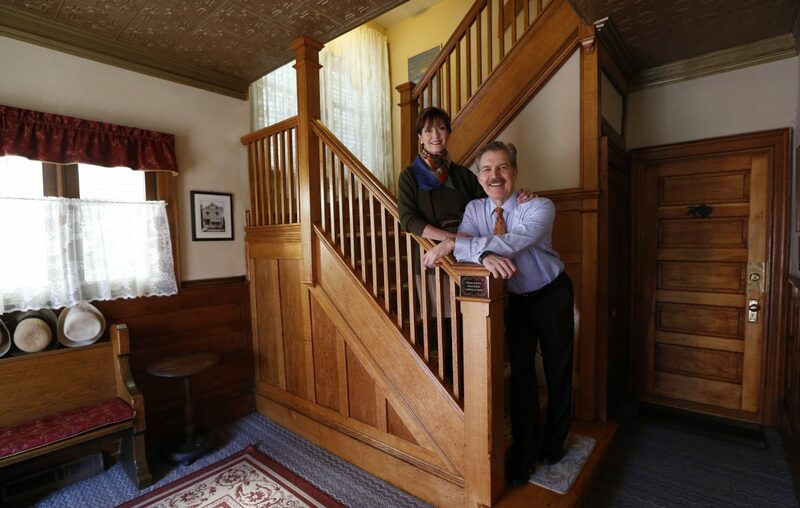 * The Elmwood Village home of Tom and Maria Tarapacki was featured online as a Buffalo News "Home of the Week" in February 2018. Here is the article, with a link to a before-and-after gallery of photos they submitted.